This is a documentation video of an installation I worked while attending a residency program in Korea. I researched on Japanese and Korean historical issues and focused on “Comfort Women”. 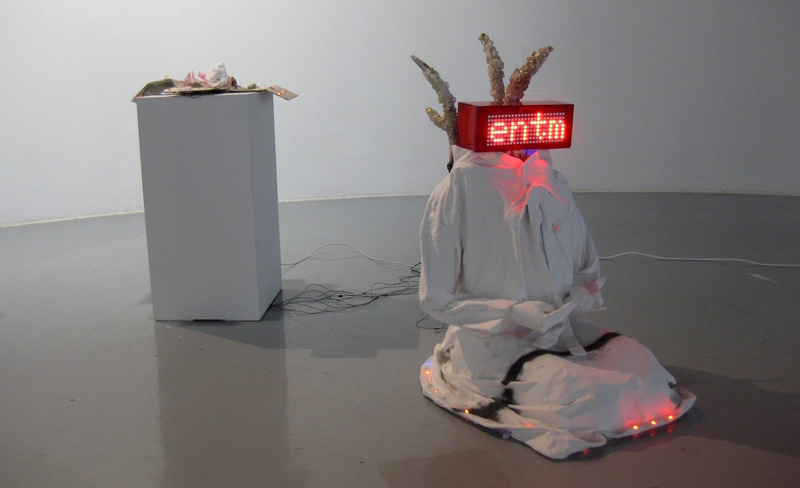 This work consists of a statue of a comfort woman that wears the traditional Korean clothes with an LED board that shows a text message from audiences. There is another broken hand casting left in a box with a sensor; when the sensor senses the viewer, it starts playing sound of voices of comfort women with table saw and nailing sound like construction. The words makes no-sense as if cut-off and jumbled up by the table saw. LED lights light up the whole sculpture in an ironical sense of bargaining the statue or it is a shop-front. Even though the subject is heavy, the work shows direct reactions from audiences by showing their own messages through a web-form, which suggest not only how they are aware of the subject but also it affects the entire impression of the work; power of the words. Above two images: (top)an instruction of how to send texts to the work through network. (bottom)a screen shot of the webpage where audiences can send texts/messages. The broken left hand of the statue with a motion sensor that catches audiences and start playing sound of the comfort woman story.